Thanks to all those who came and supported us. We managed to raise £1082 with your generous donations. Thank you to all who attended and well wisher donations. We helped the Scouts by holding a RACENIGHT to incorporate with our HANDOVER. Thanks to all those who supported this event. We have raised in access of £800 through your generocity. We trust you all had a good time. Special thanks to all sponsors. Thanks to members of SLP Samaj for their support. With your kind generosity and support we were able to raise £870. WHAT A FABULOUS CHARTER CELEBRATION EVENING! 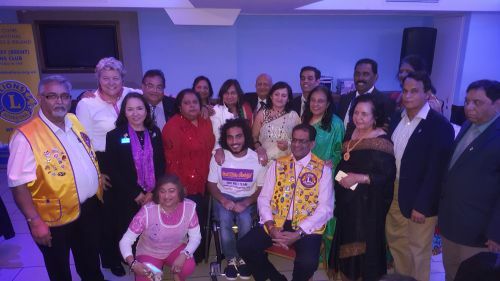 This year we joined hands with Lions Clubs of London (Hendon) and Kenton. We take this opportunity to thank all attendees and their generous donations. 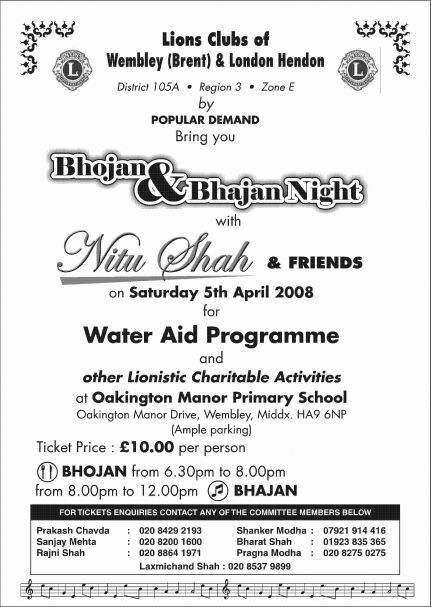 We want thank all those who attended had a very enjoyable evening, Nitu and her friends were just marvelous and our heartiest gratitude for everyones generosity. It was 33 years ago in 1969; the late Jack Fields achieved his ambition of forming a Lions club in Wembley sponsored by Harrow Lions Club. The club formed with nineteen charter members inducted on 6th June 1969 and Charter presentation was made on 7th October 1969. Twenty-One members today carry on serving the community, nationally and internationally. We take this opportunity to mention a few of our high points below. A donation of £3,500 was made towards the purchase of a bungalow at Kings Holiday Camp, Eastbourne to which was attached a portacabin housing a dialysis machine supplied by the Royal Free Hospital. The club donated £500 to wards the purchase of a cassette recorder for the Brent Visually Handicapped Group for Talking Newspaper. Financed the provision of special playground equipment for the mentally handicapped at the Kingsbury Hospital. Eleven sets of Speech Training equipment donated to the Neasden Clinic at a cost of £1,350 to combat deafness amongst the babies and young children. £1,000 donated towards the purchase of a tail lift mini-bus for the Dollis Hill School for the mentally handicapped children. Supplied a kerb climbing electric wheelchair to Jyoti Raja and shared the cost of a Batricar provide to an elderly ex-seaman. Donated £1,500 to Brent Community Transport for a special tail-lift. Contributed £1,200 towards the cost of "once in a lifetime" holiday for terminally ill children when two children from Brent were sent on a trip to Disney World in Florida organised by Les Evans Fund. Linda Brooks was presented with a computer/word processor, which was supplied by PRIVATbanken Limited. Won £3,000 for our charity account when three members participated in The Sunday Times National Business Finance Game.